The weather has been terrible in Wisconsin so when Travelmista had a last minute schedule change to go to a conference in Marco Island, I tagged along. 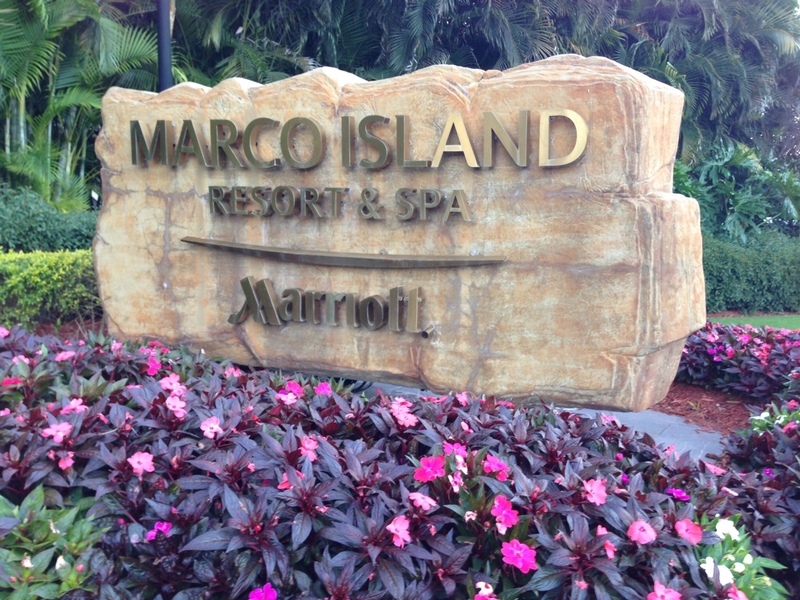 The conference was at the Marriott Marco Island Resort. Having never been to Marco Island we fell in love with the nice weather and easy going lifestyle. While Travelmista had to work most days, I enjoyed the resort and the beach. I just want to say that I loved this resort! We had a double room facing on courtyard near the kids pool area. The beds were extremely comfy and felt like home. The bathroom was large and rooms had wonderful finishes. All the details were perfect. I am an interior designer so I notice everything. One thing that I loved about the room was the safe that inside the drawer. It was convenient and had an electrical outlet inside the safe so you could charge your computer while it remained safe. I love this detail! The resort was located right on South Marco Island Beach. You could just walk outside the door and hit the beach looking for sea shells. There were other people on the beach walking but it never felt crowed and I felt safe being by myself throughout the entire stay. This resort would be perfect for a family vacation with young kids. They had special activities just for kids such as sand art. Since Travelmista spent most of his time at the conference I had lots of time to people watch. The staff was nice and genuine. I spent time at the pool enjoying the sun. There were plenty of lounge chairs in the sun and the shade. If you wanted to order food or drinks you would just raise the flag on the lounge chair and the wait staff would visit. This was nice because they never bothered you unless you raised your flag. We had great experiences with all the staff and they seemed to go out of the way to make sure the resort was perfect. One day when I was walking to the pool I not-so-gracefully slipped on some water in the main corridor. The staff that saw me made sure to wipe the floor before continuing on with his job. On the last night of the conference there was a big reception with a Mardi Gras theme. The food was excellent and was well staffed at all the action stations. The theme continued to the food with gumbo, jambalaya, muffulettas, oyster on ice, oyster shooters, shrimp, crawfish, steak, and salad. For desert it was beignets, king cake and banana foster. Yummy! It was an excellent event. The only disadvantages that I can come up with is our room was on the first floor near the elevators and one night we were awoken to people being loud in the hallways at 3am due to the conference. Our room was also easy to see into from the courtyard due to being on the ground floor. The food was quite pricey but the quantity and quality was very good. The service was also excellent so I guess you get what you pay for. We can't wait come back to Marco Island again! View from room with the kids pool in the background.